Two iron cannon have been found and recovered from the wreck of the Henrietta Marie. These guns each fired four-pound round iron shot and are of a type known as “minions.” The two pieces are marked with their weights – “6-3-24” and “6-3-20” - which denote in hundredweight (112 pounds per hundredweight) that one weighs 780 pounds and the other 776 pounds. One of the guns bore an “S” cast on its trunnion, which is the mark of the Stream foundry located in the village of Chiddingly in Sussex in the south of England. 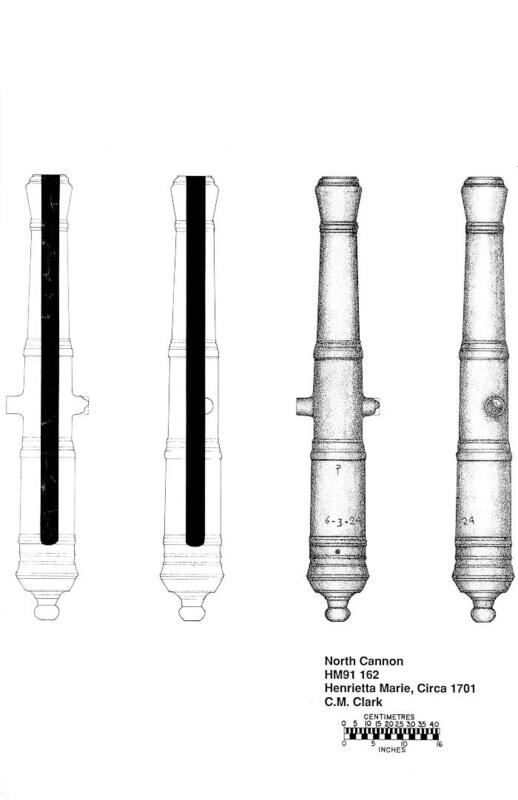 The guns were cast for John Fuller, who supplied marine armament during England’s 1688-1697 war with France. It is known from historical documentation the Henrietta Marie carried eight guns. A number of three-pound iron shot found on the wreck make it clear that some of the six missing guns were smaller, three-pounders. The Henrietta Marie, and slave ships generally, had to be well armed to protect themselves against pirates. Pirates were looking to steal anything that might make them money, and to capture a slave ship could mean a large cargo of African people or trade goods, a hefty store of provisions, or the ship itself–all things that were useful to the pirates or easily converted to cash. A suite of artillery made it harder for a ship to fall prey to the ocean bandits. A minion, using 3 pounds of black powder and a ball of 3.5 pounds, had a point-blank range of 150 yards, with a maximum range of around 1500 yards. One of the Henrietta Marie cannon was found with a wooden plug in its mouth. This stopper, called a tampion, kept water and debris from entering the bore and fouling the piece.